WHEN ASR IS OUT PAR NOT AVBL UNLESS ACFT HAS OPNL TACAN. ACFT WILL EXECUTE INSTRUMENT APCH & REPORT 10 DME ON TAC OR LOC COURSE FOR PAR PICKUP. ELMENDORF HOSPITAL HELIPORT; SIX MILE LAKE ARPT AND SIX MILE LAKE SEAPLANE MONITOR ELMENDORF ATIS 124.3/273.5 OR CTC BASE OPS 134.8/372.2 FOR LCL ADZY. PAR AVBL BY NOTAM. ASR APCHS UNAVBL WITH OUT PAR. FULL SERVICE WX BRIEFING AVBL 0600-2000 WKDAYS EXCP HOLS; OTR TIMES CTC ALASKAN WX OPNS CNTR DSN 317-552-2719/2003 OR C907-552-2719/2003. PAR AVBL 0100-1700 MON-FRI EXCEPT HOLIDAYS. A110-1 LNDG RWY 16 NOT RCMND FOR JET ACFT EXCPT DURG DAY VFR DUE OBSTRN 337' MSL LCTD 1950' FM THR & 574' W OF CNGRLN. A110-10 NOTICE: A RIDGE EXTENDING FROM APPROXIMATELY 260 - 020 DEGREES ONE TO TWO MILES FROM THE TOWER PREVENTS OBSERVATION OF FOG OVER KNIK ARM. VISIBILITY MAY DROP RAPIDLY AS FOG POURS OVER RIDGE. A110-13 ALL ACFT MAINTAIN IDLE POWER ON OUTBOARD ENG WHILE TAXIING. A110-14 NO SIGNS OR PAINTED HOLD SHORT LINES ON INTERSECTING RYS. A110-17 EXTENSIVE SVC DELAY FOR FUEL. A110-2 HGR SPACE & WARM STORAGE EXTREMELY LMTD OCT-MAY. A110-23 FREQUENT ACTIVITY IN R2203. WHEN UNABLE TO AVOID CTC ATCT. A110-25 SPECIAL AIR TRAFFIC RULES FAR PART 93, SEE REGULATORY NOTICES IN THE SUPPLEMENT. A110-27 LIMITED MAINTENANCE CAPABILITIES ON WKEND. A110-3 PREVENTIVE MAINT: TACAN WED AND FRI 1600-1700Z; ILS TUE AND THR 1500-1700Z; PAR SAT-SUN 1800-2000Z; ASR SAT-SUN 2000-2200. A110-30 JOAP, JOINT OIL ANALYSIS PROGRAM AVBL. LHNIT, LOW & HIGH PRESSURE NITROGEN SERVICING AVBL. A110-31 CHANGE JET AIRCRAFT STARTING UNITS (JASU) TO, (A/M32A-86), MC-1A), (MC-2A), (AM32A-60A). (AM32-95)150 +/-5 LBS/MIN (2055 +/-68CFM) AT 51 +/-02 PSIA. LASS 150 +/-5 LBS/MIN @ 49 +/-2 PSIA. A110-33 OIL: O-123, O-128, O-133, O-148, O-156, JOAP. A110-34 JOAP & LOW & HIGH PRESURE NITROGEN SERVICING FURNISHED DURING NORMAL DUTY HOURS, OTR TIMES ON REQUEST. A110-35 FLUID: PRESAIR, DE-ICE, NITROGEN-LHNIT. A110-48 RY 16/34 RUBBER ACCUM NORTH & SOUTH 1000FT. A110-5 QUIET HR 0630-1400Z WKDAYS; 0630-1600Z WKEND & HOLS, AMC ACFT EXEMPT. A110-57 IFF SVC AVBL. AFLD WX IS AUTOMATICALLY MNT BY AN/FQ-19 AUTOMATED WX OBSERVING SYSTEM AND BACKED-UP/ AUGMENTED BY HUMAN OBSERVER WHEN NECESSARY 24/7. DSN 317-552-4903/4397OR C907-552-4903/4397. FULL SVC WX BRIEFING 24HRS 17 OPERATIONAL WEATHER SQUADRON DSN 315-449-8333 OR C808-449-8333. A110-58 C17/C130 OVERT LIGHTS AVBL ON RY16/34. C17/C130 COVERT LIGHTS AVBL ON RY 16. A110-59 NVD OPS ON RY 16/34 & RY 06/24 MON-FRI FROM 0400-1000Z++. A110-61 DURING EVAC OF WX STATION, CTC 17 OPERATIONAL WX SQUADRON AT DSN 315-449-8333. A110-62 ALTERNATE WX LOCATION VISIBILITY OBSTRUCTED FROM SE-W DUE TO HANGARS. USE PHONE PATCH WHEN WX RELOCATES TO ALTERNATE LOCATION.PHONE PATCH CAPABILITY THROUGH 3 WG/CP AT 907-552-3000. A110-66 CAUTION: NUMEROUS ACFT WILL BE OPR IFR BETWEEN 1500-2000 MSL FROM BGQ 092/10 INTO R2203 TO EDF 320/07 INVOF BIG LAKE, PALMER, BIRCHWOOD, GOOSEBAY AND WASILLA, AK., MON-SAT 0300-0800Z++, AND TUES AND THU 1800-2200Z++. A110-7 CAUTION: MOOSE ON & INVOF RWY. A110-70 CAUTION: HEAVY RAINFALL MAY CAUSE HIGH POTENTIAL FOR HYDROPLANING FOR CONC ENDS OF RWY 06 AND RWY 24. A110-71 RWY 34 DEPARTURES FOR ACFT WITH WINGSPANS GREATER THAN 98 FT RQR PRIOR COORD WITH AMC, ATC TWR, OR ALD MGT. A110-72 DV SPOTS 1 AND 3 LTD TO ACFT WITH WINGSPANS OF 136 FT OR LESS. A110-73 CAUTION: UNLIT TERRAIN 0 FT AGL/341 FT MSL, 1909 FT PRIOR TO THLD, 1914 FT RIGHT OF COURSE. A110-74 CAUTION: WHEN RWY 16 VGSI INOP, STR-IN TO RWY 16 ONLY AUTHORIZED AT NIGHT WITH MAJCOM A3 APVL. A110-75 TWYS D1, D2, N4 & N5 PERM CLOSED. A110-76 AFLD MGMT DOES NOT HAVE COMSEC STORAGE AVBL, FOR COMSEC STORAGE CTC COMMAND POST DSN 317-552-3000. A110-77 ALL TRAN AIRCREWS OPERATING AT ELMENDORF AIRFIELD MUST DROP OFF A COPY OF THEIR CREW ORDERS TO AFLD MGMT UPON ARR. A110-78 ALL VIP ACFT CTC BASE OPS 30 MIN PRIOR TO ARR ON PTD 372.2 OR 134.1 OR C907-552-2107. A110-79 ACFT REQUIRING CUSTOMS AND AG INSPECTIONS ARE RQR TO CTC BASE OPS NO LATER THAN 90 MIN PRIOR TO ARR. 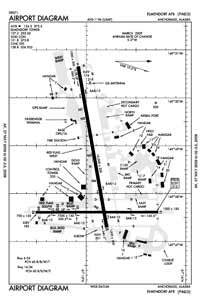 A110-8 DURING VMC DEPS/MISSED APCHS/GO AROUNDS; ACFT SHALL MAINTAIN AT OR BLO 1200' MLS UNTIL DEP END OF RWY 06. A110-80 PPR REQUIRED FOR ALL NON-JBER ASSIGNED ACFT EXCEPT NON-EXPLOSIVE LADEN AMCC ACFT. A110-81 SUBMIT ALL PPR REQUESTS UTILIZING THE PAED PPR REQUEST FORM LOCATED IN THE PAED GIANT REPORT STIF TO BASEOPS3@US.AF.MIL NO EARLIER THAN 30 DAYS PRIOR AND NO LATER THAN 48 HOURS PRIOR TO ARRIVAL TO BEGIN COORDINATION FOR PPR. A110-82 PPRS WILL BE ISSUED NO EARLIER THAN 7 DAYS PRIOR TO ARR. A110-83 NORMAL BARRIER CONFIGURATION DUR FTR FLY WINDOW LEAVES 5675' BTN CABLES ON RWY 06/24, OUTSIDE OF FTR FLY WINDOWS THERE IS 7658' BTN CABLES. A110-84 ACFT REQUIRING CABLES DE-RIGGED MUST CTC BASE OPS 24 HR PRIOR TO ARR OR MAKE REQ PRIOR TO PPR BEING ISSUED. A110-85 AMC ACFT ON AN AMC ASGN MSN CAN EXP TO HAVE MAINT SVC ACCOMPLISHED BY 732 AMS. A110-86 UNITS DEPLOYING TO, STAGING OUT OF, OR FLYING LCL SORTIES AT ELMENDORF AFB MUST DEPLOY WITH MAINT PERS REQUIRED TO COMPLETE OPS TO INCLUDE DE-ICE QUALIFIED CREWMEMBERS DUR COLD WX OPS. A110-87 ANY DEPLOYED OR STAGED ACFT WILL NOT RCV TA SUPPORT BYD INITIAL BLOCK IN. A110-88 UNLESS PARTICIPATING IN MAJCOM SPONSORED EXER AT ELMENDORF; DEPLOYED OR STAGED UNITS MUST CTC 3 WG SCHEDULING AT DSN 317-552-2406 OR C907-552-2406 AS EARLY AS POSSIBLE TO COORD LOCAL AREA ORIENTATION BRIEFING, MAINT SPONSORSHIP IF APPLICABLE, AND 3 OG/CC APVL PRIOR TO LCL AREA OPS. A110-89 TRAN ALERT ACFT SVC LTD TO POL SERVICING, INTAKE INSPECTIONS, MAGNETIC CHIP DETECTOR INSPECTIONS AND EOR INSPECTIONS. A110-9 ALL FTR ACFT ON ARR EXPECT REDUCED SEPARATION; SAME TYPE ACFT AND DAY 3000 FT; DISSIMILAR ACFT AND/OR NIGHT 6000 FT; AHEAD/BEHIND FORMATION LDG-6000 FT.
A110-90 IF EXP TO USE RWY 16 FOR DEP OR RWY 34 FOR LDG SEE JBER CARTEE AIRSPACE DESCRIPTION IN NOTICES SEC OF THIS SUPPLEMENT. A110-91 ALL NON-AMC ACFT RQR 732 AMS MAINT/SVC MAY EXPERIENCE LOGISTICAL DELAYS DUE TO MISSION NECESSITIES. A110-92 FOR CURRENT RCR/RSC'S ON RWY 06/24 AND RWY 16/34, AND AFLD RCRS CTC TWR. A110-93 EAST RAMP HOT SPOT 19 LTD, EXPLOSIVES CAT'S 1.1 AND 1.2 GREATER THAN OR EQUAL TO 450 LBS N.E.W. RQR EVAC OF BLDGS 16521 & 16519 FOR DURATION OF HOT ON HS19. FOR BLDG EVAC CTC 907-552-2577. A26 ARFF FAA INDEX D/ CAT 8/10. A43-06 RY 06 PAPI UNUSBL BYD 8 DEGS EITHER SIDE OF COURSE PATH. A43-24 PAPI RY 24 UNUSBL BYD 7 DEG RGT OF COURSE. A49-06 APCH LGTS EXTND 15'' ABOVE SFC UP TO 100' PRIOR TO THR. E147 TPA, OVERHEAD 1700 FT MSL, CONVENTIONAL 1200 FT MSL, COPTER/LGT ACFT 800 FT MSL.